“This state holiday is always celebrated on 27 April. It may also be known as ‘Day of uprising against Occupation’ and in Slovenian, it is known as ‘Dan upora proti okupatorju’. Not the most colorful presentation, but everything was scrumptious. Here we have some mushroom soup, potica, cabbage rolls, and aubergine and pepper caviare. So I chose to make Slovenian Style Stuffed Cabbage Rolls. They were pretty tasty. I am not the biggest fan of cabbage rolls. I hated them when I was a kid, but I’ve come around on them and these were good! 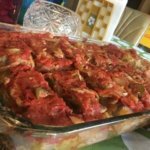 Funny for a person who doesn’t love cabbage rolls I have two of my own cabbage roll recipes now! I think next time I’ll make it deconstructed like my other recipe for Deconstructed Stuffed Cabbage, because I had a hell of a time boiling that big old head of cabbage. Brian and I nearly scalded ourselves dropping it into the vat of boiling h2o. Then taking it out it dropped and splashed on me. It really was a mess. To make these rolls “Slovenian” the common thread was covering those bad boys with sauerkraut. I used Trader Joe’s Raw Fermented kraut, and they had little pickles in there, which gave them a nice touch I thought. Another thing that made these Slovenian style was cooking the onion first in bacon fat or lard. For mine I used Earth Balance and some Bac’n bits, used crumbled tofu for the beef, and a half a package of Gimme Lean Lightlife Sausage. 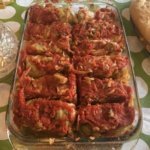 Click here for the recipe for my Vegan Slovenian Style Cabbage Rolls, or scroll on to the bottom of this page. I didn’t take the best photo of this soup unfortunately, but it was very good. Danielle used a recipe from Homemade Slovenian Food, but made a few modifications. She used 3 kinds of mushrooms, Baby Bella, Shiitake, and Porcini. Click here for Danielle’s recipe or find it at the bottom of the page…you know the drill. “I do my grocery shopping on Sundays and don’t cook until Wednesdays so I look for ingredients that will keep that long or that I can freeze. Also, since I don’t normally cook, I obviously look for something that’s going to be super easy and quick. The only tricky thing to this recipe was the eggplant since it’s been a long time since I’ve cooked with fresh versus frozen. I wish I had known to skin it before cooking it, which was difficult. I agree that this one would have been awesome with some crackers or bread. If we were to make it again that’s how I would serve it. Some modifications she made from the original recipe from All Easy Recipes. Eggplants can be very “high maintenance” so I try to use Chinese eggplants in most recipes. They do not need to be peeled or seeded, and don’t have the bitter flavor that most eggplants have. I hear in California they are available at most supermarkets, but here in Florida I have to make a stop at the Asian or Indian Market, Clemons Produce has them sometimes, but I can’t depend on it. I had a bit of this stuff leftover from Thursday and I added it to some pita pockets with seasoned lentils, spinach, and a creamy cucumber sauce. Great addition!! Julie made this rockin sweet bread. It was neat to have a dessert offering on the table this week. Loved this stuff…maybe too much. I cut myself a large slice for leftovers and ate the entire thing like a starving rat in my kitchen the next morning. Loads of recipes this week. Click here for Julie’s Potica or find it below! Boil cabbage and remove leaves. Shave the hard rib from each leaf. Mix flax with water and set aside for at least 5 minutes. Saute onion in butter and bacon bits. Add garlic and rice to toast for the last minute. Add onion mixture and flax with the tofu - salt and pepper in a large bowl. Cover bottom of casserole with some tomato sauce and small or broken cabbage leaves. Add about 2 heaping tablespoons of mix into each roll and place in casserole dish. Repeat until done, about 12 rolls fit nicely into a 9x13. Cover rolls with crushed tomatoes and top that with the sauerkraut. Cover that with a few small or broken cabbage leaves. Add a little broth or water, about 1 cup, but do not overfill, as you'll boil over during the cooking. Cook covered in foil for 2 hours. Let sit for a few before serving. Remove top leaves and serve. Soak porcini mushrooms in hot water. Pan fry onion and garlic in about 1 to 1 ½ tbsp. olive oil quickly over med-high heat until you start to see caramelization, about 1 to 2 minutes. Place onions and garlic into crockpot with the potatoes, carrots, sage, and thyme. Strain the porcini mushrooms and save the soaking liquid. Squeeze remaining liquid from the porcinis and add them and liquid to the pot. Add in the rest of the mushrooms. Pour vegetable broth into the pot and add in water until all the vegetables are covered. Stir. If using a crockpot, set to low and let cook for about 8 hours. After 8 hours, strain out some of the potatoes and mash them. Add potato mash back to pot. If using buckwheat grains, soak them in hot water for about 5 to 10 minutes, strain and add to pot after 8 hours. Start adding in the remaining olive oil, salt, pepper, agave, vinegar, garlic powder, and paprika. Make any adjustments you’d like to get the taste you want. Let simmer another 20 or 30 minutes. Adapted from Roti and Rice. Currently a placeholder. Waiting on Instructions. Will edit when complete.